Sharing my coffee mugs with you, originally uploaded by KT Flicker. 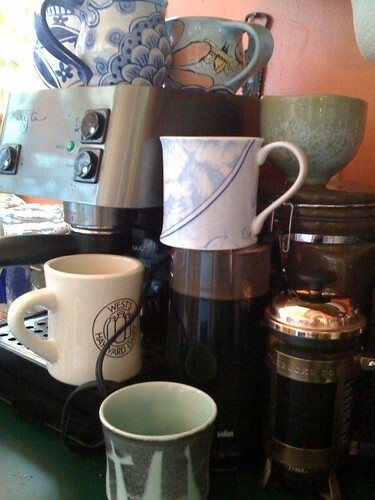 Here are my little coffee mugs, a collection of which mostly fits in the cup cupboard, but there are two on display in the living room, and two that forever live on top of the espresso machine next to a sugar bowl because they were made by the same pottery studio, Damariscotta Pottery in Maine. Dinah crawls on my head, then continues to sleep there. Somehow on Saturdays, she knows that it's the weekend, and becomes ever more insistent, pacing from the bed to the bedside table to my head, thereby causing Oliver to be rowdy, and Gerdy to be particularly urgent about going outside. I feed them all, put the kettle on for water, do left-over dishes, water the plants, and clear the counter to make coffee. This is my favorite part. Each morning I think about what kind of mood I'm in, and choose from one of my little coffee mug friends to help nurture that mood the whole day through. My usual, hard at work mug, is the blue and white round one in the top left corner. It was my first official collectible piece of pottery. Even though I may be feeling hard at work while drinking from this mug, I feel like I can endure anything. The little blue one next to it with the bumble bee is if I'm feeling in hard at work mode, but with a lighter twist (am drinking from it now). The two odd shaped ones - the gray and teal one up front and the teal bowl-like one on top of the canister are from Mugi Pottery and are also collectible pieces of pottery, but these ones I bought myself, so they are the first investments in pottery I've ever made. I was overcome with the collection, and also bought some for my brother and sister-in-law. These call my name when I'm feeling particularly quirky, almost in a sideways direction of creativity. The cream, diner-like one is just that - a very thick mug from West's Hayward Creamery in WI that David and I bought when we were at a wedding. We were overcome with the cuteness of this little ice cream shop, and were respecting the entrepreneurship of it all. I drink out of this mug when I'm feeling hard at work, but want a fresh approach. And finally, the newest addition to the bunch: the blue and white mug from Rosanna that is perched on the coffee grinder. This is my first piece of actual china (aside from a cute collection from Ikea). It is thin, but not too delicate, and the lines and whimsy on it are incredibly fresh. This mug called to me the morning of the Collective-E launch, because it signifies new life. Then on Saturdays, when the day is mine and I'm beholden to no one (as a home office worker, if you're not one already, you will learn that you never leave your office, so you begin to carve out spaces in your mind of 'your' time, and time when you are answering to everyone), I listen to the back of my mind for a song. Usually there is one lingering back there, left-over from dreams. This morning, after I decided to blog about sharing my mugs with you, the term "sharing my mugs with you" reminded me of a Cowboy Junkies song , which I can't quite put my finger on. So, after the mug was selected, and the coffee was made, I tuned into the Cowboy Junkies Trinity Session and sat down to write this.